Start with one of our designer favorites and customize your heart out! 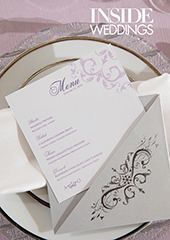 Choose from our collection of gorgeous designs to set the tone of your event perfectly. Choose from 3 versatile formats with matching enclosures, folios and pockets. We are so proud to be a part of this gorgeous lilac and silver feature! Get our love letters straight to your inbox for access to updates, inspiration and offers. No ones loves a stuffed inbox so we usually only contact you once a month. Cancel anytime.